Times are changing, and architecture undoubtedly also experiences evolution in terms of looks, designs, and trends. But what is really exciting is when styles take a step forward while, simultaneously, also borrowing from other designs, resulting in a unique look that one cannot ignore. 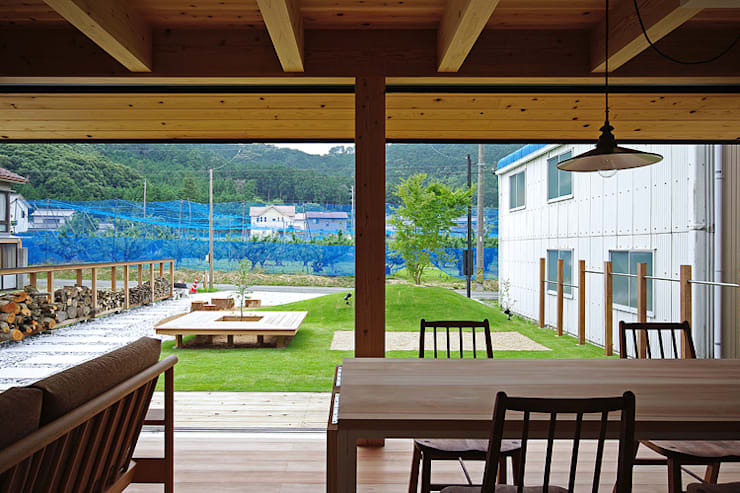 Today we take a look at a suburban home from a Japanese architect who decided to replace the classic Japanese style (less is more) with a more modern approach to minimalism. In addition to the charming interiors and welcoming layout, the house was also constructed near a vast forest, ensuring a fresh and lush landscape for the homeowners’ backdrop. Standing inside, we see the view that the house’s front facade looks out on – and it’s quite a unique combination of contrast and comparison. The interiors make abundant use of wood (just notice those timber flooring and furniture), linking up strongly with the forest on the horizon. But our interior spaces are quite warm and friendly thanks to the neutral colour palette, which balances beautifully with the deep greens stretched out in the distance. 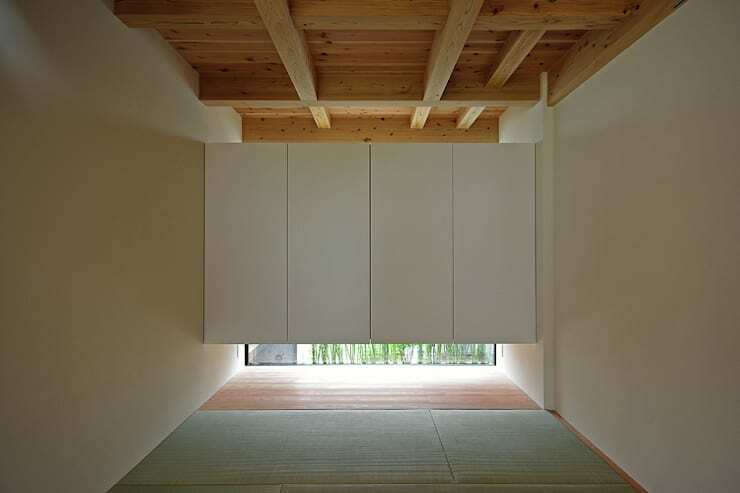 As we said, the Japanese style (and minimalist design) prides itself on a ‘less is more’ look, and our architect wanted this to shine through in the constructed results. Here, we can see that the house, although charming and quite pleasing to the eye, has a very straightforward approach to design – yet don’t dare call this little abode ‘dull’ or ‘boring’. A simple yet elegant little terrace frames the front facade, while a striking touch of snow-white pebbles (contrasting magnificently with that fresh green lawn) leads us to the front door. In addition to the generous glass-coated sliding doors, three skylights ensure an extra dose of natural lighting for the interiors. It very rarely happens that a bathroom is treated to a generous window, as we tend to require a certain amount of privacy for this room. But how is this for an alternative that treats this bathroom to both a stunning amount of natural light, plus adequate privacy? It looks directly out onto a garden courtyard, ensuring that no curious passersby will see what they’re not supposed to see. 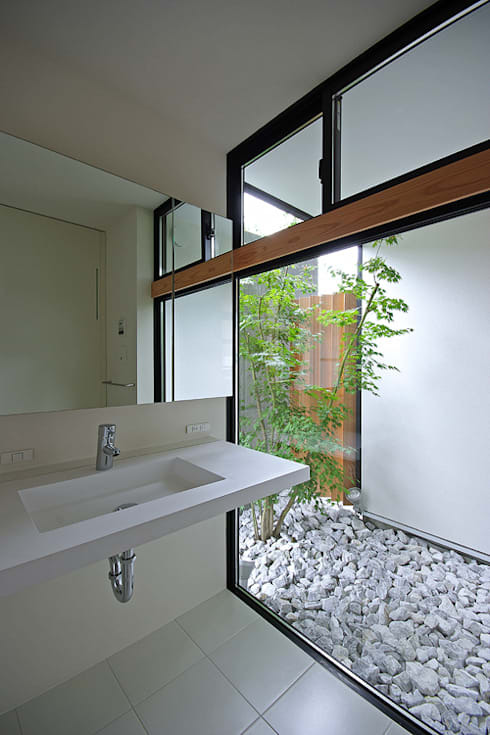 And how stunning do those tranquil white pebbles flow with the bathroom’s soothing colour palette, making the rock garden seem like a physical extension of the bathroom? Bless the creators of the fireplace, for they have made winter just a little less unbearable, and have created an indescribable feeling of pleasure when roasting in front of a crackling flame while it’s freezing outside. This black metal beauty stands out most strikingly from the surrounding whites and warm timbers, which is sure to lead to many lazy winter afternoons spent indoors. 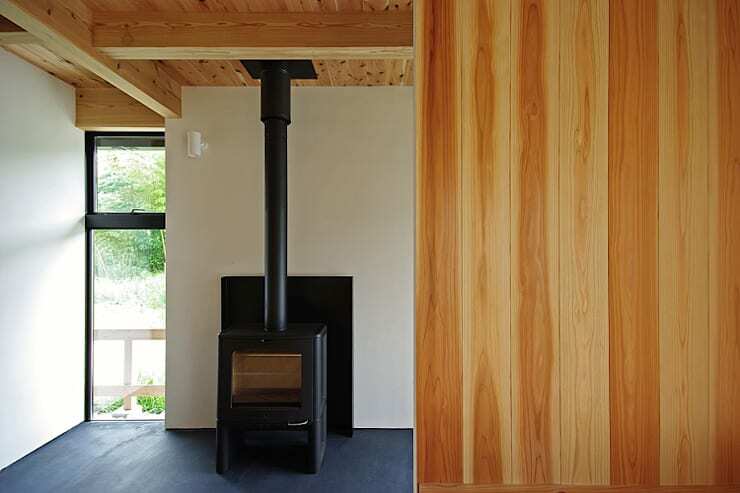 Let’s warm up that interior inspiration with these: Hot fireplaces for the modern house. A room that’s a bit limited in terms of space needs all the creativity it can get – and here we have a very unique approach. Instead of cluttering the bedroom with furniture and unnecessary ornaments, our designer opted to have the bed built into the floor, and the closet lifted a few feet above the ground, resulting in a curious floating look. A few wall art prints or decals can enhance the décor look quite nicely, or it can be left as is to enjoy that clean, open, and tranquil vibe. After all, the bedroom is where we rest and reload, not admire decorative embellishments, right? 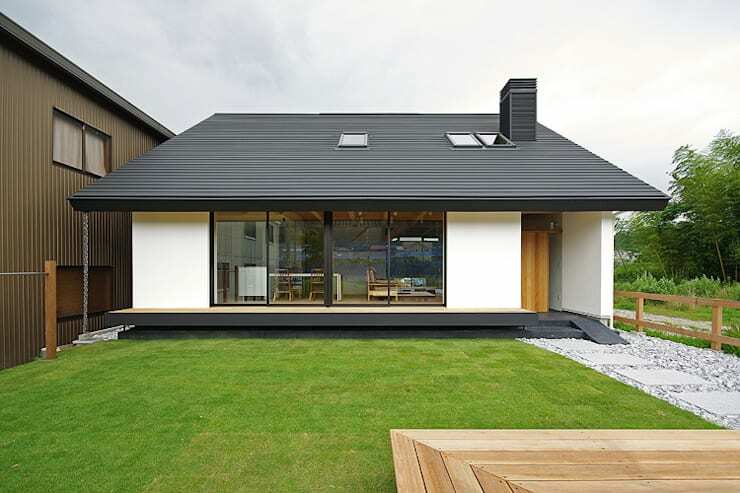 We love hearing from you, so share with us your thoughts on this ‘less is more’ house.